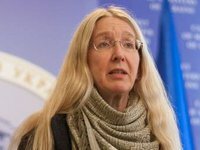 The Cabinet of Ministers of Ukraine plans to increase the amount of financing of the healthcare system by UAH 25 billion over three years, Acting Minister of Health Ulyna Suprun said on the air of Channel 5 last Friday. "Within the next three years, the Cabinet of Ministers plans to increase the financing of the healthcare system by UAH 25 billion," she said. Suprun also noted that according to the government bill on medical reform, by 2020 the amount of spending on the healthcare system will be increased to 5% of GDP. Earlier, Prime Minister Volodymyr Groysman said the draft state budget for 2018 envisages an increase in the financing of the healthcare system by UAH 11 billion to UAH 112.5 billion.